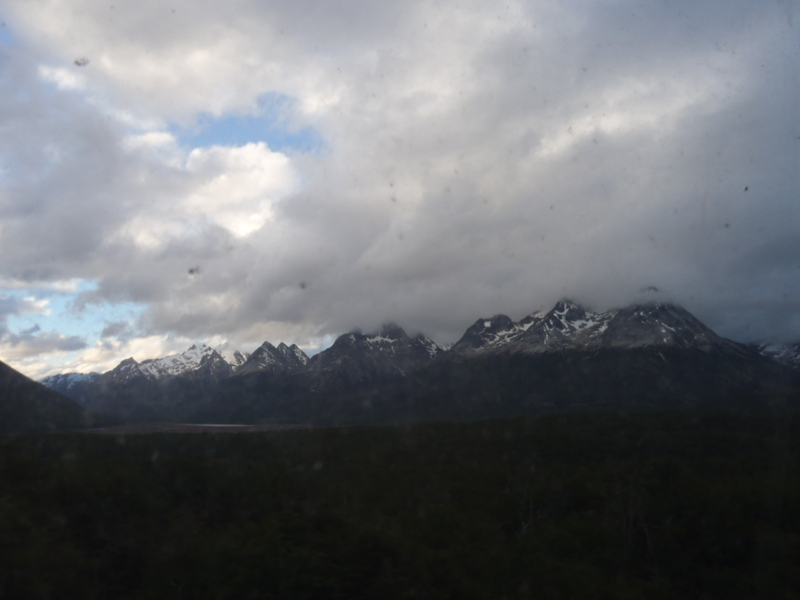 Almost immediately after climbing on the bus in El Calafate, I fall asleep. 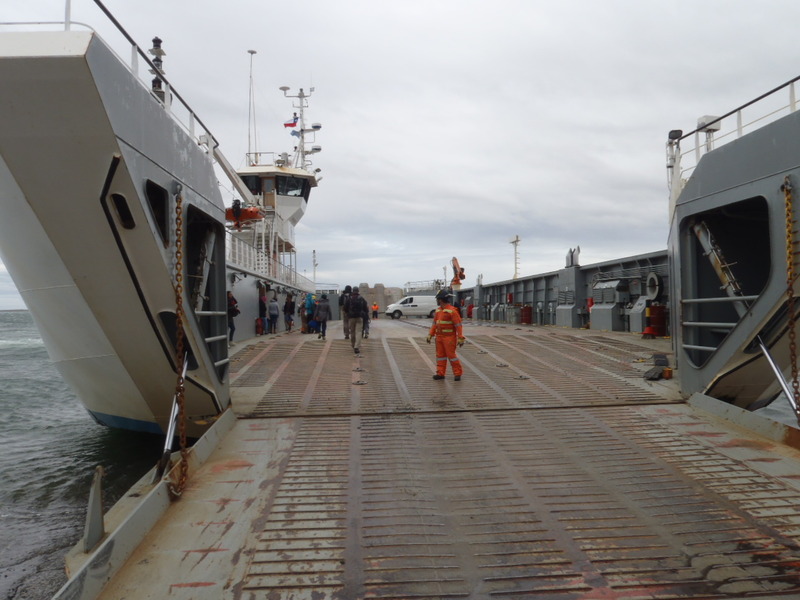 I wake up as we’re pulling into Rio Gallegos – it’s raining so I can’t see much of the surrounding terrain, but it looks pretty flat and boring. I’m a long way from the Andes at this point, I’m actually right back to the Atlantic Ocean. The town itself is equally uninteresting, at least from the bus window, with only utilitarian one- and two-story buildings visible. We’ve got a couple hour delay here so I walk around in the rain for a bit but I don’t see anything worth hanging around – grocery stores (still closed), gas stations, tire shops. We climb onto the second bus. As we roll out the weather’s starting to clear up a bit and the terrain is the same steppe I’d seen between El Chalten and El Calafate, a bit grassier but basically identical. I’m going back to sleep. 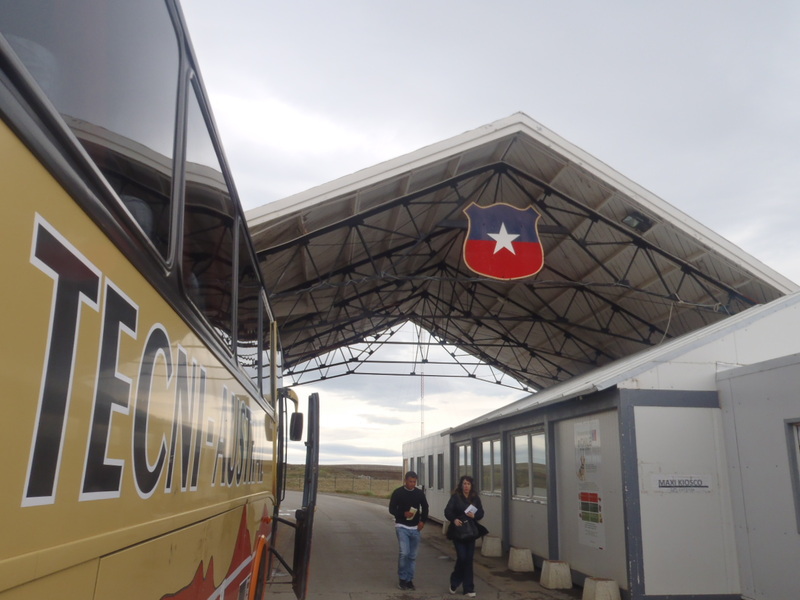 I wake up to see we’ve stopped at the Chilean border. 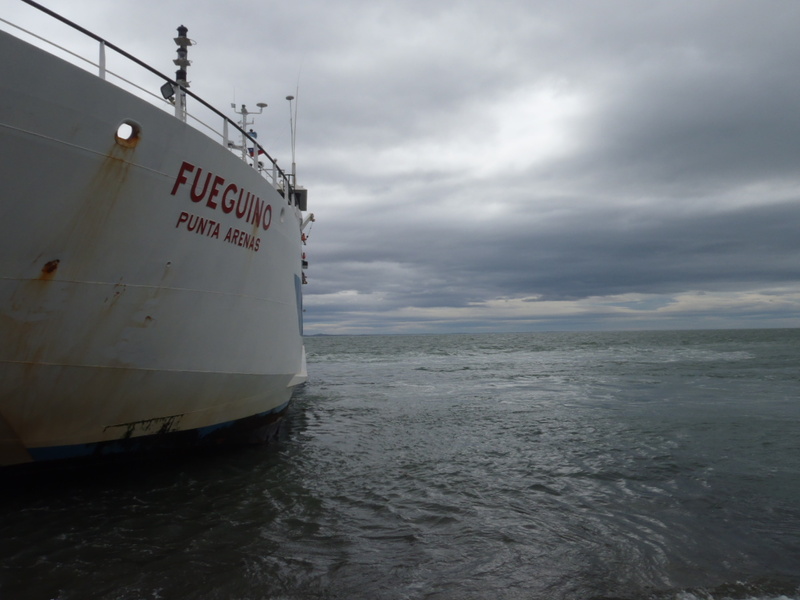 Because of the bizarre nature of the Chilean-Argentinian border we have to cross the tail end of Chile – including Chilean Tierra del Fuego – to get into Argentinian Tierra del Fuego. The crossing’s easier than the one from Mendoza to Santiago. The drug dogs are out but since the bus is ultimately ending up back in Argentina before the baggage section will be re-opened, there’s no search of our checked bags. As I check out of Argentina the border official demands to see my “visa”. I don’t have a visa, what are you talking about? Eventually it turns out she’s talking about proof that I’ve paid my reciprocity fee. Good to know folks – make sure you’ve got this on your way out of the country, not just on the way in! The grasslands continue until we reach a boat ramp, where there’s a ferry waiting to take us to TDF. My GDPoS point-and-click camera won’t focus on the horizon so I can’t get a pic. I’m seriously going to smash this thing when the trip’s over. The ride’s short, maybe half an hour. There are two small “visitor lounges” that are hot and cramped so I hang out with the cars – occasionally a large wave crashes over the side and down over the cars and myself. There’s a cafe on board selling greasy hot dogs so I grab one. The boat takes a sharp turn, the boat stops, the gate opens and I get my first close-up view of TDF. As we start moving I realize it’s a bit anticlimactic. TDF has been my goal for the trip but looking around, it’s nothing but more grassy steppe. The road’s a dirt track and aside from the occasional natural gas pumping station, flock of sheep and guanaco, there isn’t much to see. The flat terrain does let me see something I hadn’t caught sight of in Patagonia, the South American grey fox, which is actually a “zorro”, or a “false fox”. There are very few signs of habitation, maybe one or two tiny towns with a school and a government buildings. We reach the next border crossing. 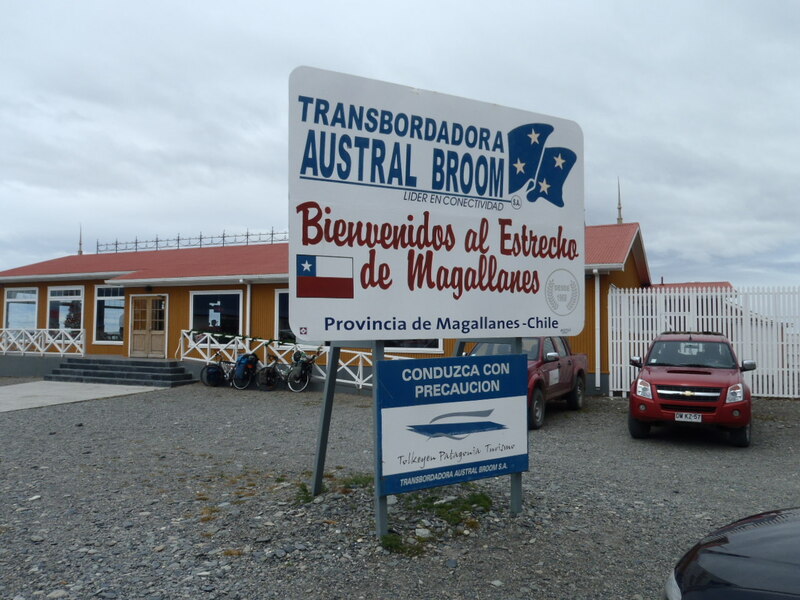 It’s a bit different than the other Chilean-Argentinian crossings I’ve been to: both of the previous two crossings were integrated so you walk from one country’s desk to the other’s. 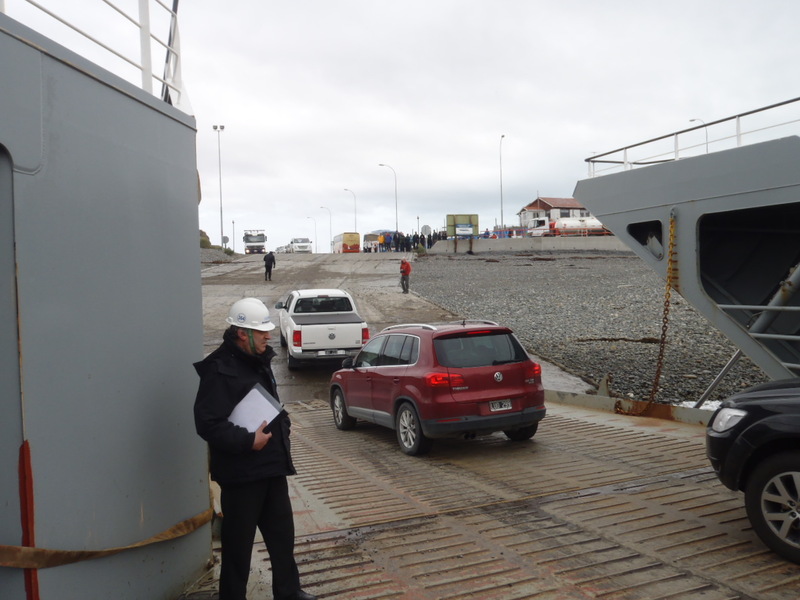 After we quickly run through the Chilean post there’s a 14 km no-man’s-land until entering Argentina. Once again I need to show my proof of reciprocity fee payment. I’ve now got four Chilean stamps and five Argentine stamps across three pages of my passport. The terrain doesn’t change much after the border but the sheep are replaced with cattle and the road’s well-paved, so we make good time to Rio Grande. A welcome sign on the way into town declares it to be “The City of Your Dreams” and as we drive in I wonder about the kinds of fucked up dreams some people have as it appears mostly industrial and wind-ravaged. The center of town actually seems pretty cool though, every house is unique but built in a similar, unconventional style. We have to change buses and about half of us – all tourists – pile onto a similar but rickitier and rustier rig. Almost everyone on the bus turns out to be French. I talk to Gregory and Sonia a bit (Damien ended up on a different bus) but mostly keep to myself in the back, thinking I might get a bit more sleep. As we head south the terrain actually starts to get interesting, though. Trees begin to appear and they’re twisted, stumpy-looking coniferous things. Many of them are dead, grey and bare. Some of them look fine on one side while looking dead and completely covered in foot-plus-long strands of lichen on the other. 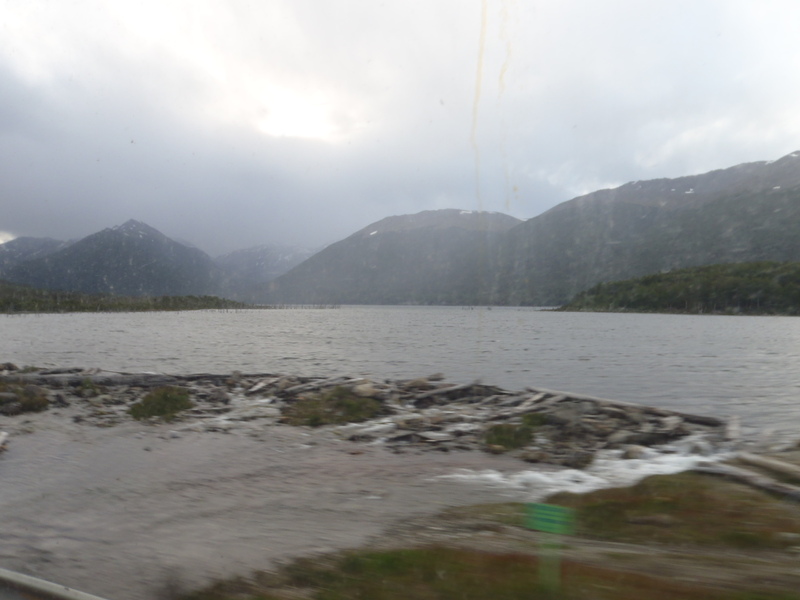 Not long after, the landscape completely transforms and goes back to what I’d gotten used to on the Carretera Austral, lakes and snow-capped mountains. The road responds by twisting up. With the day almost over we crest a hill and a city in a cove becomes visible. 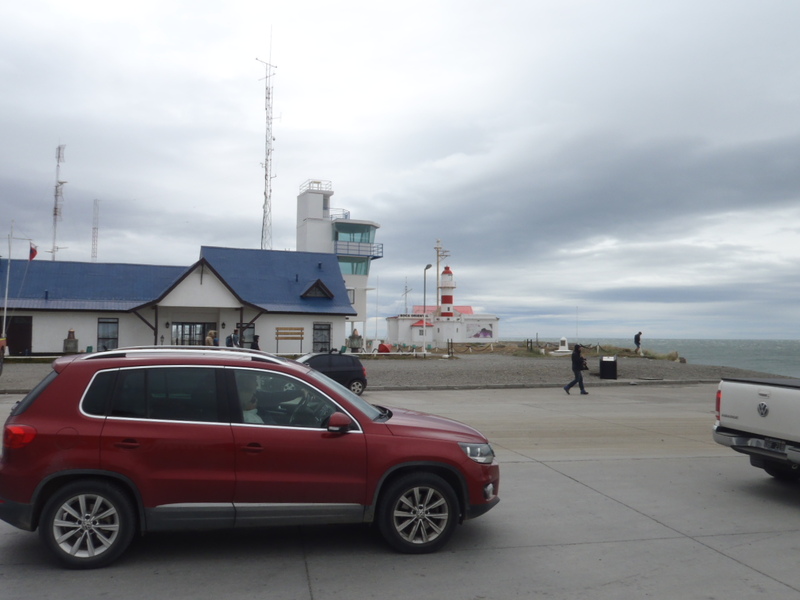 A welcome sign says “Ushuaia”.